It’s a hot summer day. You’ve spent the morning shopping along the Magnificent Mile, or perhaps you were museum hopping or just taking in the city’s sights. Now you are warm and hungry, and your feet are tired and sore. You are ready for a break. Head to Millennium Park, where art meets park, to enjoy a meal, relax, and maybe even cool your feet in a fountain. At lunchtime folks are scattered over the park’s lawns, benches, and cement walls picnicking, reading, or sunning. The Great Lawn of the Jay Pritzker Pavillion, stretching beneath the canopy of a stainless steel trellis-like structure, is a picnic haven during the day, then becomes free seating for concerts most summer Wednesday, Friday, and Saturday evenings. You can often hear music rehearsals during the day. If you don’t have picnic food with you, you can dine al fresco on the patio of the Park Grill, which in winter becomes an ice skating rink. Beyond the Great Lawn, the BP Bridge winds and curves over Columbus Drive toward the lakefront. The bridge’s wood plank walkway and stainless steel angled and curved sides combine art with function, beckoning you to cross the bridge just for the sake of crossing. For more stainless steel art, don’t miss the iconic Cloud Gate (better known as The Bean because of its kidney bean shape), a sculpture by Amish Kapoor. 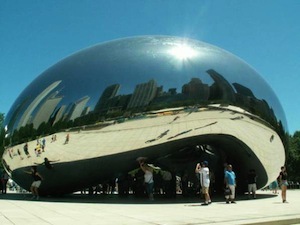 Tourists often surround The Bean, cameras in hand, snapping pictures of the brilliant reflections of themselves and the city’s skyline in this highly polished sculpture in the center of the park’s plaza. To cool off on a hot day, head to the Crown Fountain. Fountains are always refreshing sights when you are warm, but standing in them is usually prohibited. Not so in this fountain. You are welcome to kick off your shoes and splash all day, if you’d like, in the shallow pool that spans between two 50-foot glass-block towers with water cascading down the sides. 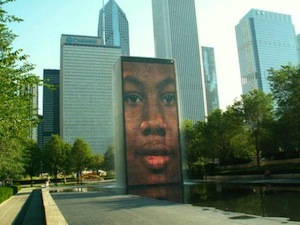 The towers flash LED pictures of Chicago residents’ faces. Look out below! The “faces” spew out an occasional gush of water from the mouths, so if you’re standing just below them, you may get drenched. If you feel conspicuous frolicking in the pool of the Crown Fountain, make your way to the canal at the Lurie Garden instead. No more than three feet wide and a few inches deep, the canal that runs the length of the Lurie Garden adjacent to the boardwalk is a perfect spot to sit and dangle your feet in the water while you plan your afternoon. When you have cooled off and are rested, take a walk through the two-and-a-half-acre garden with over 138 varieties of perennial plants. You can take a guided tour of the garden at midday on summer Fridays and Sundays. After your respite in Millennium Park, cross the Nichols Bridgeway into the Art Institute, where you can spend the rest of your day perusing thousands of works of art, including Grant Wood’s American Gothic and an impressive collection of impressionist paintings by artists such as Monet and Renoir. 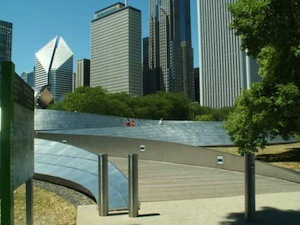 Millennium Park is located along Michigan Avenue two blocks south of the Chicago River, between Randolph and Monroe. Tours are offered daily at 11:30 a.m. and 1:30 p.m. on a first come, first served basis. For more information, visit http://explorechicago.org/city/en/millennium.html or call 312-742-1168.